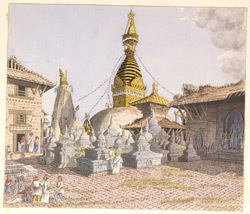 Watercolour of the temple of Adi Buddha at Swayambhunath in Nepal, by Henry Ambrose Oldfield (1822-1871), c. 1850-1863. Dr Oldfield, who was Residency Surgeon at Khatmandu from 1850-1863, wrote: "The great temple to which the name of Sambhunath is specially applied, is a very fine and perfect specimen of a Buddhist chaitya, or mound-temple. It consists of a solid hemisphere of earth and brick, about sixty feet in diameter and thirty feet in height, supporting a lofty conical spire, the top of which is crowned by a richly-carved pinnacle of copper-gilt. Its only basement is a narrow cylindrical plinth, faced with slabs of stone, and which projects about two feet round the base of the temple. The hemisphere is somewhat flattened above; is covered with plaster, and is frequently overgrown with grass and weeds. The square toran or basement of the spire, has a projecting cornice above and below; it is covered with plates of copper-gilt, and has the two eyes of Buddha, painted in crimson, white and black colours, on each of its four sides. Springing from the tops of the four sides of the toran, are four large angular slabs...also of copper-gilt, on each of which are five bas-reliefs of various Buddhas, Buddhisatwas, Lamas, and other eminent Buddhist saints." This image shows the temple with numerous small stupas in the foreground.